Since the days when ancient Greeks and Romans reclined at table and ate salad, there has been dispute over whether to eat it before or after the Main Course. People settled the matter by serving it whichever way they preferred and calling it the better one–for reasons of health or palate or predilection. 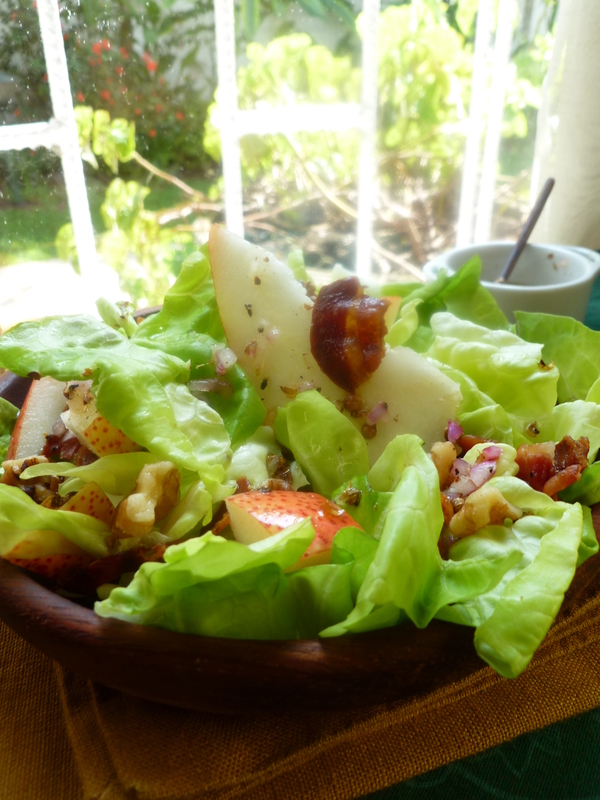 Today the salad continues to maintain its flexible character in a meal–sometimes turning up under the guise of a First Course instead of a discreet Salad Course, and, on occasion, becoming the Main Course. You can’t be sure when you will run into ‘the Salad’. Sometimes it hangs back until the end of the meal and shows up…for Dessert. Flexibility describes the making of a salad, too. The boundaries of what edibles may go into one are exceeding wide. How to group them is the thing to consider–finding out the congenial ones. Here is one harmonious variant of this centuries-old, adaptable dish called ‘salad’. 1. Toast the coriander seeds in a dry pan. This will take only a few minutes and you will know they are done because they will begin to darken and will have a pleasant fragrance. 2. Put them in a mortar and crush them coarsely or pulse them in a blender or food processor–or use the flat side of a knife blade to do the job. 3. Put the crushed coriander in a small bowl. Add the minced shallots, 1 Tablespoon of lemon juice ( more if you like), and whisk in the olive oil. 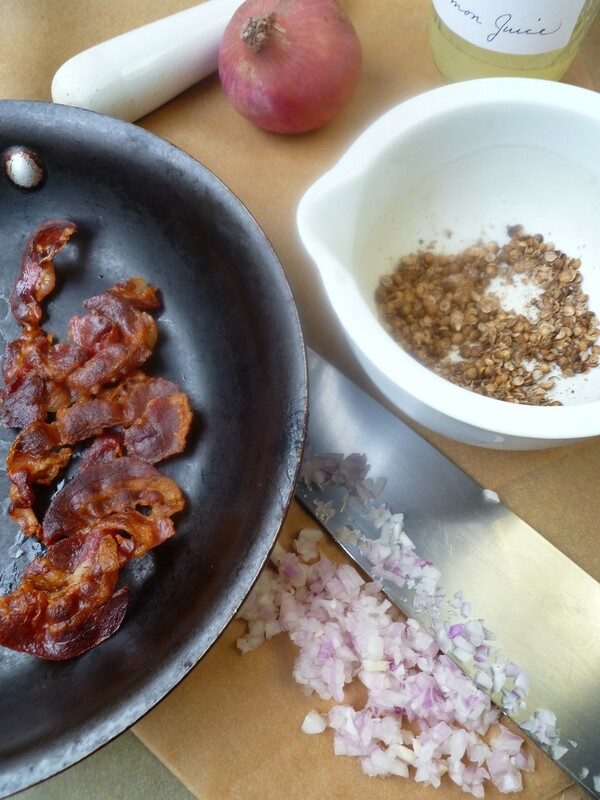 Grind some fresh black pepper and salt into the vinaigrette. 1. 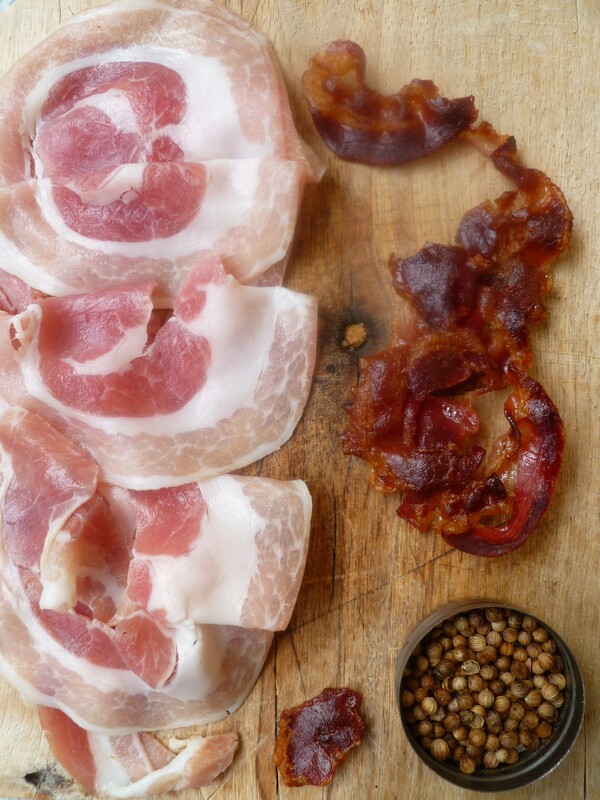 Brown the slices of pancetta slowly in a pan with a little olive oil so that they crisp and turn a reddish brown. Drain them on paper towels and let them cool to room temperature, then crumble them. 2. 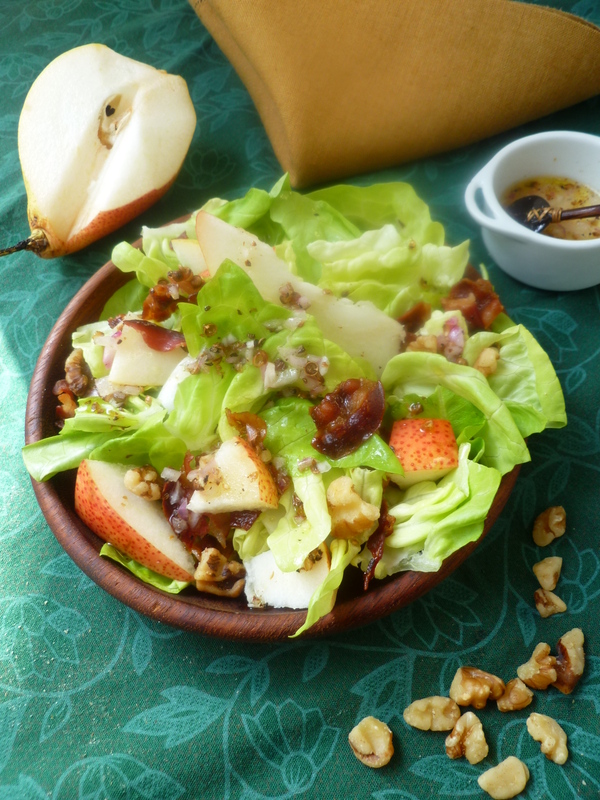 Cut 8 thin slices of pear–one to top each salad–and cube the rest. 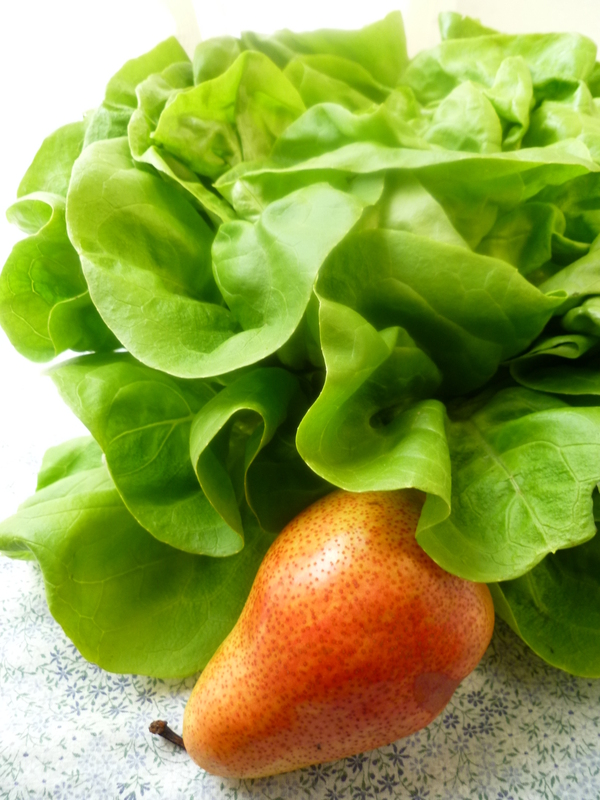 Put the pear in a bowl and mix a Tablespoon of lemon juice with it to prevent the cut pear from turning brown. 3. 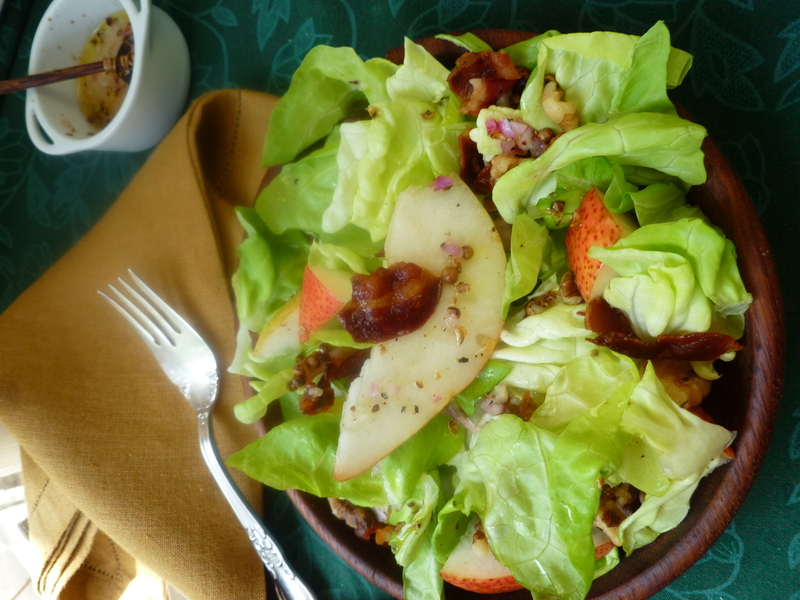 On each salad plate, arrange lettuce, pancetta and pear. 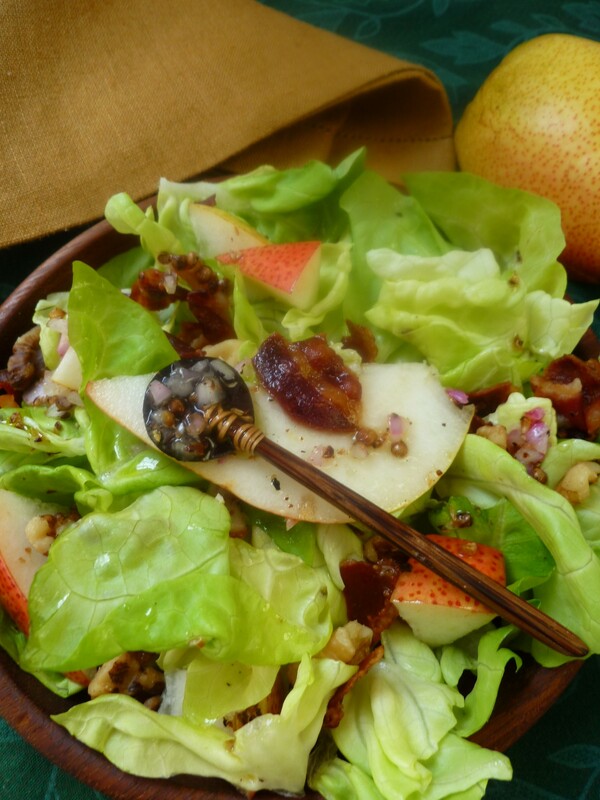 Sprinkle a few toasted walnuts on each salad and add a slice of pear to each one. 4. 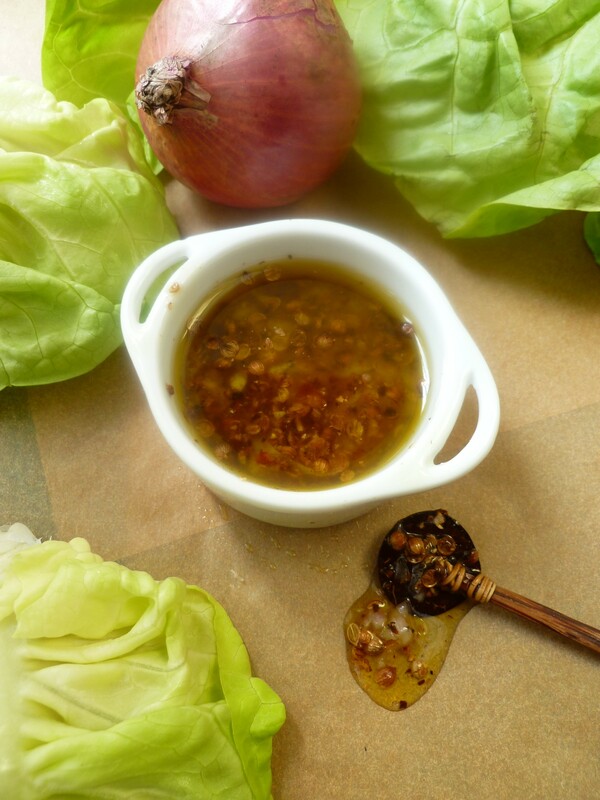 Drizzle the salads with the vinaigrette. If this salad is a course and not a meal, it shouldn’t be large–just enough on each plate so that when people finish it, they feel they wouldn’t mind if there were a bit more. 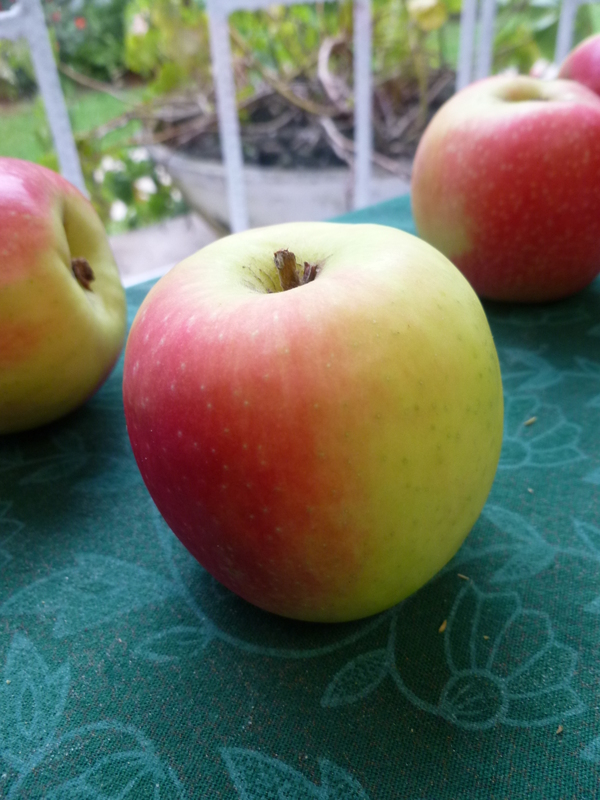 Note: If good pears aren’t available and good apples are…substitute. 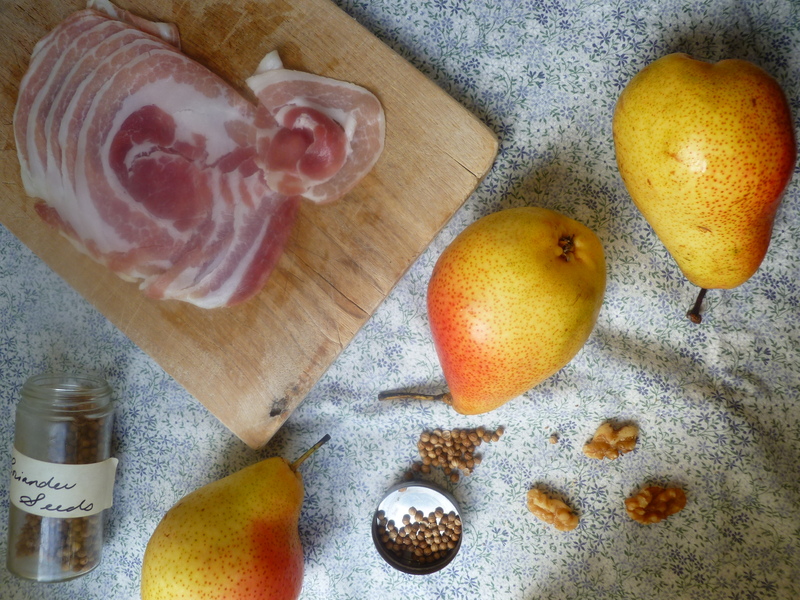 A Second Note: Pear, Pancetta and Toasted Walnut Salad is served after the First Course of the Dinner Menu: Dinner in Early Spring. It is based on a recipe that appeared in the October 2004 issue of Bon Appetit.